Choo! Choo! 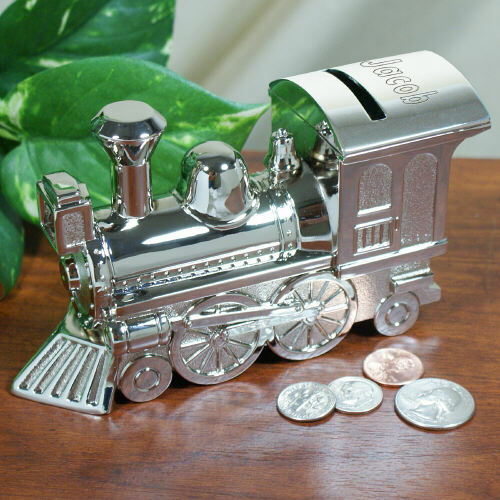 Here comes a handsomely Engraved Train Bank for your little Conductor. 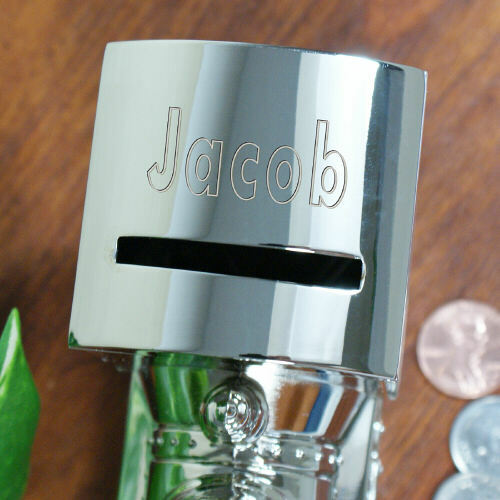 Our Personalized Train Bank is perfect for any child's birthday or an engraved gift for your ring bearer. Our Personalized Baby Gifts measure 6" L x 2" x 3¼" H and is beautifully crafted to look like a real train engine with a silver pewter finish. All Customized Baby Gifts include FREE engraving! Engrave your Silver Train Bank with any name. I have purchased custom engraved jewelry for my grand-daughters all with oddly spelled names. So I was desperate to find a gift for my 8 year old grandson that could have his name engraved as well. He loves trains so when I stumbled on this website and saw the perfect gift, I was overjoyed. The product is beautiful! It is heavier than I imagined it would be, the craftsmanship is spectacular. It is absolutely perfect, exactly what I want. Thank you for providing this very unique product. I can't wait to give it to my grandson!